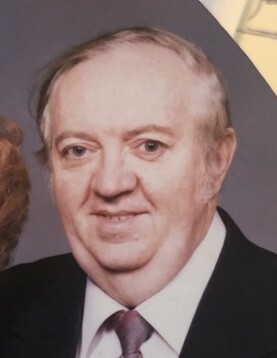 Obituary for Regis Carroll | Schrock-Hogan Funeral Home & Cremation Services, Inc.
Regis Carroll, 86 of Speers, passed away peacefully at his home on Monday, February 11, 2019. He was born June 15, 1932 in North Charleroi, the son of the late John Regis and Virginia Steen Carroll. Regis was a member of Mary, Mother of the Church Parish in Charleroi, Charleroi Lodge No. 1030 I.O.O.F, Charleroi Masonic Lodge No. 615 F.& A.M., S.A.R. and the Ancient Hibernian. He was a founding member of the M.M.V.T.A.. and Emergency Management Director for the Borough for Charleroi and Dunlevy. He retired from Wheeling-Pittsburgh Steel Allenport Plant and then was a real estate agent employed with Collins Hall Real Estate Agency. Regis for over 40 years was always active in community services from first being appointed to council to president and then mayor of the borough of Dunlevy. He was elected to Charleroi Borough Council, became President, and later was elected to the Speers Borough council completing his final year last year. He never considered himself as a politician, but an elected official putting citizens first without personal gains. Left to cherish his memories are his children Marcus Carroll and loving daughter-in-law Alice, Susie Carroll Molish and Scott (Jill) Carroll; his brother William (Amy) Carroll of Somerset. Grandchildren Kristin (Delbert) Bergman, Christopher Carroll, Rachel and Ryan Molish, Brandon Carroll, Brooke (Keith) Doleno, Ian, Jordan Aidan Carroll, Andi (Scott) Laforge; seven great-grandchildren and also nieces, nephews and his loving companion Chole. In addition to his parents Regis was preceded in death by his wife Rosalie Famularo Carroll and two brothers Mitch and Robert Carroll. Services will be private. Arrangements were entrusted to the Schrock-Hogan Funeral Home & Cremation Services., Inc. Online condolences may be sent to the family at www.schrock-hogan.com.